Ray Dean Clayton was born on April 22, 1938 to Charles and Mary (Holmes) Clayton in a farmhouse in Orient, Iowa. 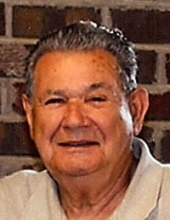 He was a 1955 graduate of Orient Consolidate School. On February 6, 1960, Ray married Victoria Griffin at Orient, Iowa. To this union they were blessed with four children. Ray died Friday, February 1, 2019 at Unity Pointe Iowa Methodist Medical Center in Des Moines, Iowa at the age of 80. In 1955 Ray entered the US Navy and served at White Sands Missile Range in New Mexico for 3 years working in research and development. After his discharge, he went to work for Convair Astronautics as a Quality Control Inspector for Atlas Missile silo installations. At suspension of the government contract with Convair, Ray went to work for Hills McCanna in Creston, Iowa and was president of the local union. Following his work at Hills McCanna, he then worked at Firestone Tire Plant as an electrician and supervisor. He started and ran his own business for several years and finally worked for the tile plant in Redfield as maintenance manager where he retired. Ray was on the Dexter Fire Dept. for 20 plus years, holding various positions in the department, and served 2 terms as president of the Dallas County Firemen’s Association. He enjoyed hunting, fishing, and trapping. He drove the equipment truck for the Dexfield football team, served on the West Central Valley School Board, and served twice on the Dexter City Council. Surviving Ray is his wife, Vicky of Dexter; daughters, Lora Russell of Stuart and Sherri Clayton of Redfield; son, Daniel and fiancé Monica of Carroll; grandchildren, Debra, Jeff, Rebecca, and Madison; seven great grandchildren; brother, Robert Clayton and wife Kathy; and sisters, Louise Sackett and Millie Clayton. He was preceded in death by his son, Michael; parents, Charles and Mary (Holmes) Clayton; sister, Marjorie Killion; and brothers, Charles Clayton, Jr. and Frank Clayton. A memorial service will be held 10:30 AM Thursday, February 7, 2019, at the Dexter United Methodist Church in Dexter, Iowa. Family will receive friends on Wednesday from 5:30 to 7:30 PM at the church. Online condolences may be left at www.caldwellparrish.com. To send flowers or a remembrance gift to the family of Ray D. Clayton, please visit our Tribute Store. "Email Address" would like to share the life celebration of Ray D. Clayton. Click on the "link" to go to share a favorite memory or leave a condolence message for the family.